Isabella (Francesca Ungaro), one of many beautiful models employed at a fashion house, is walking through the grounds that lead to the establishment one night when she is attacked and violently killed by an assailant wearing a white featureless mask. Police Inspector Sylvester (Thomas Reiner) is assigned to investigate the murder and he interviews Max Marian (Mitchell), the manager who co-manages the salon with his lover, the recently widowed Countess Cristina Como (Bartok). Max attests that he can not provide any information whatsoever that can assist the inspector, but as the investigation continues all of the fashion house’s various sins, including corruption, abortions, blackmail and drug addiction, begin to come to light. It is revealed that Isabella had kept a diary detailing these vices, and suddenly almost every employee becomes nervous. Nicole (Ariana Gorini) finds the diary, and she promises to provide it to the police, but Peggy (Mary Arden) manages to steal it from her purse during work. That night, Nicole drives to an antique store owned by her paramour, Frank (Dante DiPaolo). He is not there, and while inside she suddenly finds herself stalked by a black clad figure, who had apparently been waiting for her. She gets to the front entrance door but is grabbed from behind by the masked individual, who raises and slams a spiked glove into her face, killing her instantly. The murderer searches the corpse and her purse for the diary. When it becomes clear that she did not have it, the killer runs out of the shop. The murderer next visits Peggy’s apartment. The killer gains entrance simply by knocking on the front door, and when Peggy opens it, the masked figure abruptly walks inside. The assailant slaps and hits her repeatedly, and she explains that she no longer has the diary and had in fact burned it in the fireplace. When her attacker checks the fireplace to see if she told the truth, she tries to pick up a telephone to call for help. Enraged, the murderer hits her over and over again in the face until she is knocked unconscious. The assailant then carries her away just as the police arrive. Peggy is taken to another location and tied to a chair. The killer tortures her, demanding to know where the diary is. The woman reaches up and knocks off the mask. The shocked girl recognizes her assailant, who proceeds to kill her brutally by slowly pressing her face against the red-hot surface of a burning furnace. 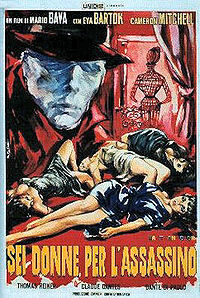 Inspector Sylvester is convinced that the murderer is one of the men employed at the fashion house, so he arrests all of those he believes might be related to the deaths. However, while the suspects are in custody, Greta (Lea Krugher) discovers Peggy’s corpse hidden in the trunk of her car, and is then attacked and smothered to death by the killer. After discovering the bodies of the latest victims, Sylvester releases all of the men. Max visits Cristina and reminds her about how he had assisted in the murder of her husband. Isabella had found out that Max had been involved in the crime, and began blackmailing him. When she started asking for more and more money, Max murdered her. It was only later that Max and Cristina realized she had been keeping a diary that revealed everything. While attempting to retrieve the diary, Max had also killed Nicole and Peggy. When Max and the other men from the agency were placed under arrest, Cristina had murdered Greta to give Max an alibi for the previous killings. Now, Max tells Cristina that he once again needs her help and convinces her that after only one more death they will be safe. That night, the voluptuous Tao-Li (Claude Dantes) is drowned in her bathtub by the masked killer who, immediately after the murder, removes the mask and is revealed as Cristina. She uses a razor blade to slice the corpse’s wrists in order to make the death seem like a suicide. Cristina prepares to leave the victim’s apartment when she is interrupted by a knocking sound on the front door followed by the loud voice of a man identifying himself as the police. She decides to escape out the second story window and then tries to climb down a drainpipe, which falls under her weight, slamming her to the ground. Later that night, Max searches through Cristina’s desk, looking for money and documents. Suddenly, a bloody and bruised Cristina enters the room, shakily holding a gun aimed directly at Max. Max had been the “policeman” knocking on Tao-Li’s front door and, knowing how Cristina would attempt to escape, he had deliberately broken the drainpipe in such a way that it would be guaranteed to collapse. He attempts to persuade his lover and almost succeeds in getting her to hand over the gun, but she abruptly changes her mind and shoots him to death. The mortally wounded Cristina collapses next to Max's corpse. Copyright(C) 2007 - 2015. All rights reserved.